Markings: The top of the barrel chamber is marked “WAFFENFABRIK / MAUSER / OBERNDORF A/N” and the left side with a double crowned “U”. The right side of the barrel is marked with an Oberndorf antler proof. The rear face of the hammer, the rear face of the firing pin retainer and the top of the backstrap are marked “6575”. The rear face of the hammer is also marked with what looks like a script “M” and the top of the backstrap with what looks like a script “N” (We are not very good with German script, so please see our pictures.). The underside rear of the bolt is marked with what looks like a script “W”. The underside of the barrel in front of the flat is marked with a script “D”, a script “G” and The inside surfaces of the grip panels are also marked “6575”. Sights / Optics: The pistol is mounted with a “V” notch rear sliding elevator sight with markings from “50-1000”. The front sight is an inverted “V” notch fixed to a rectangular base on the barrel. Stock Configuration & Condition: The grips are walnut with 23 horizontal grooves (this is the correct number of grooves for this model). There is oil staining in the grooves. There are a few dings in the bottom of the grips from the lanyard ring and a few small marks in the raised areas between the grooves. The edges of the grooves show light wear. The grips rate in about Excellent condition. Type of Finish: The pistol is blued, with a fire blued safety, rear sight slider, the sides and center channel of the rear sight ladder and the bolt stop. The hammer, trigger, lock frame, and bolt are “In The White”. Bore Condition: The bore is bright, tending to gray at the muzzle. The rifling is sharp. There is no erosion in the bore. Overall Condition: This pistol retains about 85% of its metal finish. There is finish loss on the front edge of the barrel, on the edges of the frame, and on the backstrap, with thinning on the frame rails and bolt stop. There are scratches on the underside of the barrel and the bottom of the trigger guard, with scratches and scrape marks in the backstrap. There are tiny marks through the finish on the front face of the magazine and at the right rear of the frame, with marks through the finish on the firing pin retainer where it is hit by the hammer. There are also a few light handling marks on the sides of the magazine. The serrations on the hammer and bolt are sharp and the knurling on the rear sight slider’s release button shows light wear. The grip screw is disfigured. The markings are crisp – about the best we have seen on a C96. Overall, this pistol rates in about Excellent condition. Mechanics: The rear of the frame is slotted for a shoulder stock and the bottom of the grip has a boss for a lanyard ring, with a lanyard ring installed. The barrel extension is tight to the frame. This pistol has the correct early type safety: straight back or horizontal is “Fire” and can be pushed down from there for “Safe”, with only a small amount of movement required. The action functions correctly. We did not fire this pistol. As with all used firearms, a thorough cleaning may be necessary to meet your maintenance standards. Box, Paperwork & Accessories: This pistol comes with a wooden shoulder stock/holster. The shoulder stock is walnut with an oiled finish. It has a spring loaded metal clasp at the front that locks the stock into the dovetailed slot in the backstrap of the pistol. The top tang of the clasp is marked “6575”. The rear of the stock has a push-button release hinged cover that covers the grip of the gun when used as a holster and serves as a buttplate when attached to the pistol. The cover is tight on the holster when closed. The hinge and the tangs of the front clasp are blued and show a few spots of light erosion. There are also a few small dings at the top of the front face of the front clasp. There is oil staining around the front clasp and at the front of the comb, and in a few spots scattered over the stock. There are a few deep bruises and a dark drag line on the right side of the buttstock, with multiple light handling marks scattered over the surfaces. The shoulder stock is in about Fine condition. 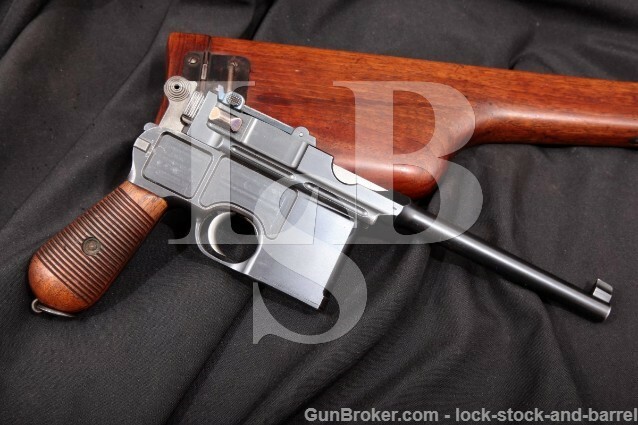 Our Assessment: The Broomhandle Model 1896 Mauser is certainly an interesting looking firearm. This pistol is a Standard Cone Hammer Model with a 5.5” barrel chambered in 7.63mm Mauser. This pistol still has its original finish and the fire blue finish on the small parts is just fantastic, so please see our pictures! We see a lot of C96’s that come through our shop, but not very many with an original finish and extremely few that are this nice. We are rating this in about Excellent condition with about 85% of its finish remaining. The lettering is crisp, the bore is bright with sharp rifling and the barrel extension is tight to the frame. The serial numbers on the gun and its wooden shoulder stock are all matching. The Broomhandle Mausers are very collectable, and although this is a fairly common variant, we expect the collectors will be extremely interested. CA Legal or CA Private Party Transferable: This Antique pistol CAN be transferred in California and CAN be sold to a California resident as a private party transaction (PPT) at our shop in Simi Valley. All cartridge firing handguns (even C&R’s and antiques) sold to a California resident must be DROS’d. This does not apply to out of state buyers.